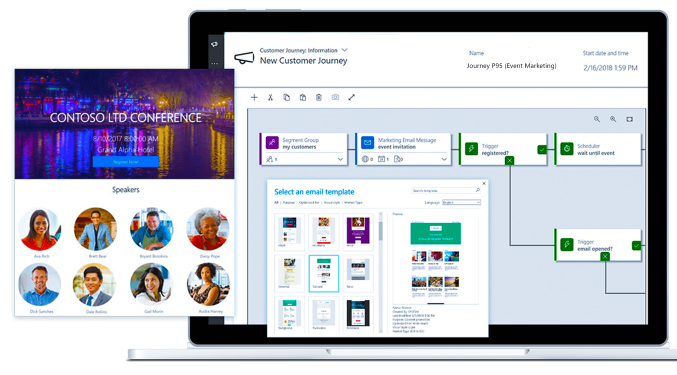 Discover how Dynamics 365 for Marketing can transform the way you do business. Dynamics 365 for Marketing is a marketing-automation application that helps turn prospects into business relationships. The app is easy to use, works seamlessly with Dynamics 365 for Sales, and has built-in business intelligence. Connect sales and marketing, automate processes, and make smarter decisions to maximize your marketing ROI. With a Microsoft Dynamics CRM integration you can seamlessly integrate your email marketing with your CRM. Manage your marketing lists and subscriptions to provide your sales team with detailed information about which emails were sent to a contact. The two connected systems bring together marketing and sales to optimize marketing efforts and sales goals. Automated campaigns can be designed using an easy drag-and-drop interface within Microsoft Dynamics CRM. Create complex campaigns with unique paths that vary as your contacts interact with your messaging. Lead-nurturing marketing campaigns can be developed to help your sales team nurture and convert leads into opportunities. Microsoft Dynamics 365 for Marketing allows you to connect to GoToWebinar, WebEx, Eventbrite and Cvent. Tracking becomes simple when all information is located in one place. Event attendance can be tracked in the contact record, which contributes to a full view of the client’s history. Even though most people associate leads with sales rather than marketing, the initial goal of marketing is to generate leads and that’s what Dynamics 365 for Marketing focuses on. Lead Generation Allows marketers to generate leads across multiple sources like emails, LinkedIn, webinars, events, etc. Lead nurturing Once a lead is generated, he’ll be getting loads of personalized messages at timed intervals to keep him in the loop about what’s going on in the business. Lead Qualification Use the business process flow and let the lead circulate through its qualification lifecycle. Lead Scoring Prioritize leads based on defined scoring models. Also provides RFM (recency, frequency, monetary value) rules based on collected data like emails clicked, events attended. Demand generation effectiveness insights Enhance demand generation processes using smart analytics, such as Power BI dashboards and Dynamics 365 Customer insights charts and widgets. Dynamics 365 provides tools to customize dashboards and generate reports for tracking campaign performance and leads responsiveness. Use the Demand Generation Analyzer to analyze the effectiveness of marketing efforts. Gain a better understanding of your target audience and potential customers with the Marketing Audience Analyzer . Keep track of leads and get rid of bottlenecks using Lead Pipeline Analyzer . Use the Lead/Opportunity Influence Analyzer to get a grip on which activities leads are most responsive to.